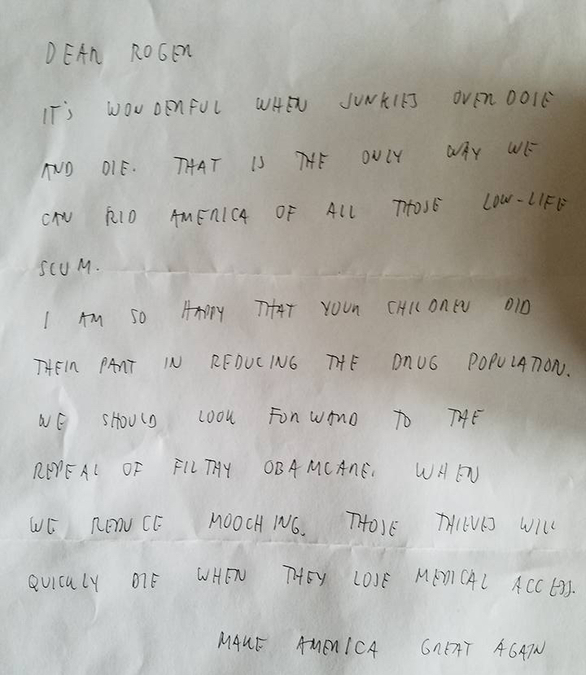 WAYNE TOWNSHIP, Ohio -- Six days before the one-year anniversary of his daughter's death from a heroin overdose, Roger Winemiller claims he received a letter from a person who was glad she had died. "It's wonderful that junkies overdose and die," reads the letter Winemiller posted on his Facebook page. "That is the only way we can rid America of all those low-life scum. I am so happy that your children did their part in reducing the drug population." Winemiller's 31-year-old daughter Heather Himes overdosed and died in the downstairs bathroom of the family farmhouse March 26, 2016. Her older brother Eugene died of an overdose nine months later. Winemiller now works to care for his one remaining son, Roger T. Winemiller, who has also struggled with drug abuse and recovery, while tending to the family's Wayne Township farm. The elder Roger Winemiller shared his family's story -- one that reflects the two-pronged challenge of dealing with addiction in an area where resources for recovery are scarce -- with The New York Times and News 5's Cincinnati sister station WCPO earlier this month. All except the one he said he received Monday. "It, at first, upset me very badly," he said. "My emotions this week are already in enough disarray." The letter, which went on to wish for a speedy repeal of Obamacare to "reduce mooching" and hasten the deaths of "thieves" who use drugs, was marked with a return address at Trump Palace, a condominium complex owned by the Trump Group. A Trump Palace employee said Monday the signature at the bottom of the letter did not match any person who had ever lived in the complex -- meaning the sender could have pretended to live at the address. Winemiller said he was able to move past the letter. The sender's viewpoint was "between them and God," he said, and it would not deter him from continuing to raise awareness for the sake of people who struggle the way Heather and Eugene did. "(The letter is) a perfect example of the what we face here in this nation," he said. "The type of people who are too heartless and self-centered to realize that addicts are beautiful people, and they are someone's son or daughter. If they had a chance to talk to a recovering addict and see how vibrant they are, how intelligent, they might think differently." He said because of the sender's apparent desire to connect their message to President Donald Trump, he had alerted police and federal authorities. In the meantime, he said he plans to continue his quest to help other families like his -- those for whom a drug might be far more readily available than treatment or support and who continue to fight despite that. "I know and realize that there are a lot of people out there that don't understand addiction," Winemiller said. "Some of them are probably willing to learn if properly educated. There are others that, no matter what evidence you show or tell them about addiction, they're going to have a closed mind on that. I respect that. "But to send that to a parent who's lost two kids nine months apart. It's ludicrous. There's a special place for individuals like this."